Starting at about 11:40 am EST, LibCal version 1 was responding extremely slowly or even timing out for some clients. Our support and tech teams jumped into action a few minutes thereafter, as soon as we were able to confirm the issues. After extensive troubleshooting and two server reboots, our tech team identified the “Confirmed Bookings” box as the culprit. Namely, a recent update caused a slowdown in the database queries related to the confirmed bookings box functionality. These slow queries then slowed everything else in the database so the entire system felt really sluggish as a result. We have commented out the “Confirmed Bookings” box code for the time being, and things are zippy again with LibCal v1. 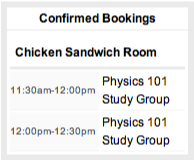 If you use Public Nicknames for your room groups, you will no longer see this box on your Room Bookings pages. Once the code for this box is tweaked, it will be restored. If you do not use Public Nicknames for your room groups, you will see no change to your Room Bookings pages. The bad news is that our clients were without reliable LibCal connectivity for 3-4 hours today, and we are very sorry about that. The good news is that in the process of troubleshooting this issue, we were able to speed up several other database queries – some in a major way – so taken as a whole the system should be responding much faster from now on, even faster than before this issue began. If you are still experiencing issues with your LibCal system, would like clarification of the issue, or have any follow-up questions, please email us at support@springshare.com. Also, if you have not yet subscribed to or bookmarked our twitter feed, please do so. It’s the fastest way to get updates about our products and to learn tips, tricks, and even new product features! We sincerely apologize, again, for this unanticipated downtime at what we know to be a very busy time of the year. We appreciate all our customers and thank each and every one of you for being on board.